It’s hard to improve upon the traditional Boston and Maine lobster roll recipe. The lobster roll that you can experience in any of the numerous lobster shacks and seafood restaurants that inhabit the Massachusetts coast line. Sometimes simple is just simply the best and there is just no reason to change anything. Nothing is better than the pure, sweet taste of lobster. But there are a couple of tricks if you want authenticity. You must use fresh, live Maine lobster. And if you want an overflowing lobster roll you can eat with a fork, plan on one 1 ¼ pound lobster per roll. And if at all possible, make sure you use New England style split top hot dog buns (with the cut sides) as the roll’s flavor explodes when toasted on a grill or skillet. For two people, order two 1 ¼ pound lobster online for home delivery or get them from your local fish market. Steam the lobster in a large kettle with steaming rack filled with about two-to-three inches of cold water. Add two tablespoons of sea salt and bring water to roiling boil. Place the lobster head first into the kettle and steam about 10 to 12 minutes. 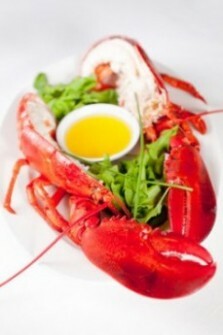 Remove the lobster and open the cooked tail, claws, knuckles and legs with a large chef’s knife. Remove any cartilage or veins from the tail.